BEFORE THIS NARRATIVE skips to the 1990 World Cup in Italy, there is a day that needs to be commented upon to help with the context of this relationship between a now-vilified Argentine and an awestruck teenager from Yorkshire. There was a fleeting moment in time, a sharing of the same space between the world’s greatest player and a 14-year-old striker playing for Hornsea Town under-14s. The event was a Football League centenary celebration match between a Football League Select XI and Rest of the World XI. The captain for the cosmopolitan side was Diego Maradona, playing in the iconic home of English football, no less than 13-months since punching and dribbling England out of the 1986 World Cup. The trip was a dad and lad affair with seven adults and seven juniors travelling to London. Pre-game, all the talk amongst the adults was of seeing the guest of honour, Pelé. Amongst six of the seven juniors it was of seeing Bryan Robson and Norman Whiteside, but for one quiet and assured junior, it was the chance to watch Maradona live. I would be able to follow him around the pitch without the restriction imposed on my view by television producers and cameramen. As discussed in parts one and two, I am a self-confessed football mercenary – I had no grudge to bare and nothing to really forgive Maradona for. At a relatively young age, I had resisted the nationalistic fervour and outcry following the Mexico quarter-final. The number 10 had provided me with endless moments of joy and breathtaking brilliance during the summer of 1986 – memories I have carried around to this day. Wembley stadium was such a disappointment: soulless, filthy and with a poor view of the pitch. The resounding boos when the Argentine was announced was deafening. I can never be sure but I imagine my clapping and silent thanks at being able to watch him was a singular action in a stadium filled with biased hatred. Every touch by Diego regardless of its footballing excellence was jeered, but for me it was a visual lecture on how to play the game. I am forever grateful to be able to say I saw Maradona play in his prime. In the intervening years between Mexico 86 and Italia 90, Maradona had continued to conquer Italy, helping Napoli to break the stranglehold of the northern powerhouses, led by Juventus, Inter Milan and AC Milan. Between 1986 and 1990, El Diego had led the Partenopei to two Scudettos, two second-place finishes, a UEFA Cup and a Coppa Italia. 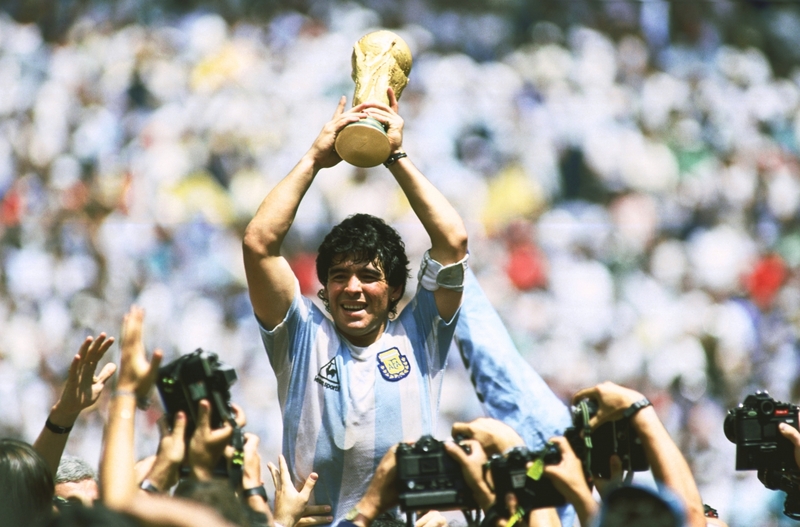 There was no doubt that between 1986 and 1990, the Argentine was the greatest player in the world. I had moved to a new school where, once again, I had no doubt I would need to defend my idiosyncratic appreciation of Maradona to my peers. From a footballing perspective, I too enjoyed relative success, including an East Riding League title, a Dixon Trophy, an East Riding Schools Cup and selection for the Humberside representative under-15s. I was at the top of my game. With the World Cup returning to Europe, kick-off times would fit in nicely with sixth form life and, with me being close to official adulthood, bedtimes would not need to be negotiated weeks in advance. Team-mates and school friends would also provide a sounding board for opinion and discussion of each and every incident for the next month, occasionally at the expense of attending A-Level English Literature classes. The 1990 World Cup saw the introduction of the Fair Play flag prior to the start of every game. Finally, protection for the skilful and punishment for the culpable. Prior to the tournament starting, there was every expectation that this would be a festival of attacking football with the best players in the world in attendance. Surely Maradona, Roberto Baggio, Ruud Gullit et al would be able to express themselves without fear of reprisal. Maradona would be playing for Argentina in the very country where he was plying his trade week in week out. A country which, eight years earlier, had literally kicked the Argentine out of the tournament. Now he was antagonising the north of Italy by making the southern provincial city of Naples the leading football team in the country, ignoring decades of tradition. Coming into the tournament, the Argentine side was once again average at best. Public opinion on the South American continent gave La Albicelestes no chance, even with Maradona in attendance. Worse still, pre-tournament injuries infected the Argentine camp like a virus. Jorge Valdano was out, Tata Brown was ruled out with days to go, Oscar Ruggeri had an abdominal strain, Ricardo Giusti could hardly stand, Jorge Burruchaga was being nursed through the preparation, and so too was Julio Olarticoechea. Maradona had a toe injury and would suffer a severe ankle injury early in the tournament. So this band of broken brothers were scheduled to kick-off Italia 90 as reigning champions against Cameroon in the San Siro, the cathedral home of both Milan giants. There are three standout memories from this game. First, Maradona flicking the ball with his left foot against his right foot and up on to his shoulder, then keeping the ball up all the way to the touchline to hand over the Cameroon pennant to the bench. Second, the brutal bludgeoning of Claudio Caniggia by three Cameroon players as he ran down the wing, the third of which scythed the long-haired striker down at the waist. Finally the prodigious leap by François Omam-Biyik to score the only goal of the game, a weak header squirming under the body of Nery Pumpido. One game in and so much to talk already. At 17 I thought I was now a seasoned social observer of football. The injustice once again of weak refereeing, a lucky goal, the hidden but undeniable brilliance of Maradona would come to the fore. These were all comments I made in defence of a game which set the tone for what was ultimately a poor World Cup. Next up for Carlos Bilardo’s men was Russia. Both teams had lost their opening group game so another defeat would guarantee the losers an early flight home. This time, Maradona would be playing at his home ground the San Paolo in Naples. After 10 minutes Argentina’s luck practically ran out. First choice goalkeeper Nery Pumpido broke his leg after colliding with team-mate Julio Olarticoechea. Then everything changed. Once again, God was there to provide the Argentines with a helping hand. With the scores at 0-0, a goalbound header from the Russian side was prevented from going in by the quick reactions and the right hand of Maradona. The Soviets surrounded the referee gesticulating while the game was still going on. I knew how they felt; I too had suffered the same injustice four years earlier. The greatest player in the world had produced another piece of blindside deviance. This time it kept his team in the tournament rather than setting up a quarter-final victory. At 17 you start to see things differently; football at this level is a win-at-all-costs endeavour. At nine and 13 the beautiful game is something you believe to be pure and played with integrity. I had to begrudgingly admire the number 10’s nerve and commitment to win no matter what, but it didn’t mean that I liked it. Argentina went on to win the game 2-0 with goals from Pedro Troglio and Jorge Burruchaga. Maradona was once again anonymous – apart from the handball – and his toe injury was clearly impinging on his ability to perform at his very best. 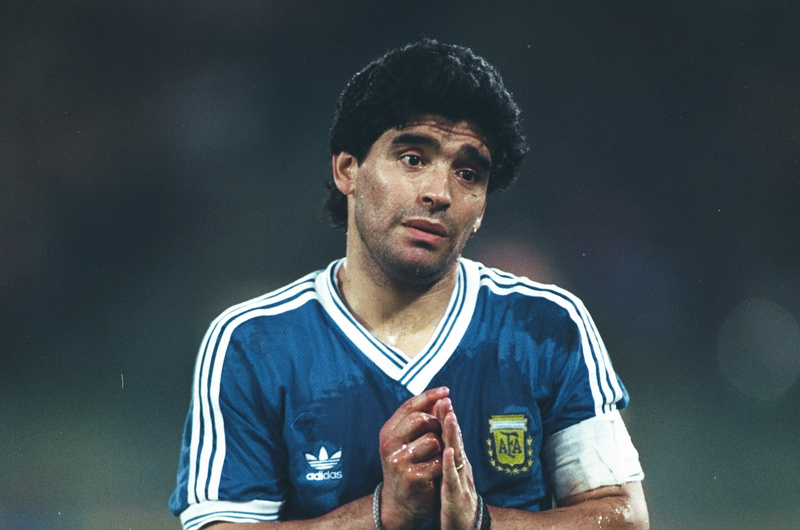 Having played every single minute of the 1986 World Cup, Maradona only managed 70 minutes in this must win game. The topic of discussion at sixth form was Maradona and the handball incident. It is easier to defend dubious opportunism when you can counteract the argument with examples of brilliance, but when cheating was the only contribution, then you are only left with the rather unsubstantial “you would have done the same”. My loyalty was being somewhat tested by the Argentine. In the final group game, Argentina secured a 1-1 draw against Romania. Maradona set up Pedro Monzón to take the lead, but poor defending allowed the Romanians to equalise and see the game out. 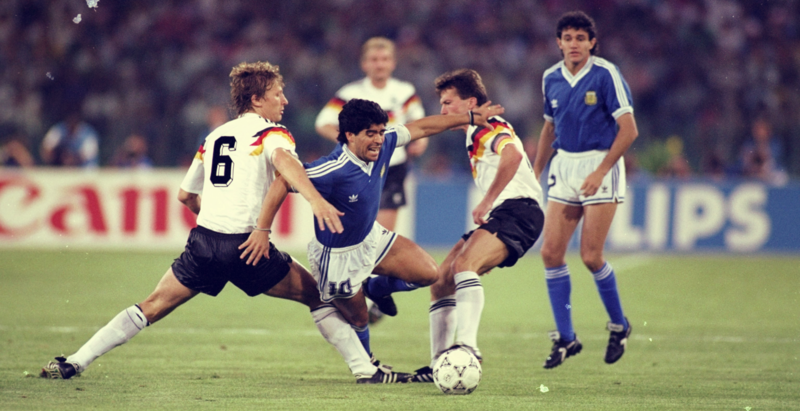 Maradona played the full 90 minutes but also suffered a kick on his left ankle that would blight the rest of his performances in the tournament. After a woeful first round across the whole tournament, the knockout stages of the tournament threw up some potentially exciting fixtures. My final World Cup as a child was proving to be very disappointing, however now there was Argentina versus Brazil to look forward to – a repeat of the infamous Spain 82 fixture, which saw Maradona leave the tournament early due to his red card. Finally, something to be excited about other than a certain Paul Gascoigne, who was starting to draw my attention with his performances while quarantined on the island of Sardinia. This time there was to be no Zico, but that didn’t matter: it was the gold and blue of the Seleção against the blue and white of La Albicelestes. “It will be a classic,” I pontificated over the sixth form common room pool table on the Friday afternoon. Over 48 hours later I was proved to be correct, though if only for the dominance of Brazil and arguably the final piece of legitimate brilliance on the world stage from Diego Maradona. The early misfortune of Pumpido’s broken leg turned out to be the best piece of luck that Argentina had all tournament. Sergio Goychochea was outstanding in the Argentine goal. Aligned with Brazil hitting the woodwork on numerous occasions, Bilardo’s men somehow kept the game level. It was the footballing equivalent of Muhammed Ali’s performance against George Forman in the Rumble in the Jungle. Argentina had lent against the ropes and taken all the best shots Brazil could throw at them. Then, when the Seleção were punched out, the greatest of them all received the ball, ghosted past three midfielders, and threaded a pass between three more defenders. Game over. Although I didn’t know it at the time, the goal marked the end of Maradona’s real influence in a World Cup. When you are younger you always believe your heroes will go on performing miracles for you, giving you moments with which to hang your childhood memories on, but as I was getting ready to leave my childhood, Maradona was getting ready to leave the world stage. The quarter-final against Yugoslavia was a truly awful advert for football. The only point of significance during the game was a wrongfully disallowed Argentine goal, after the referee thought Jorge Burruchaga had handled the ball. The game finished 0-0 and went to penalties. Maradona missed his spot-kick as players from both teams appeared nervous. Surely the defending champions wouldn’t surrender from 12 yards? Once again it was the replacement goalkeeper who came to the rescue. Goychochea saved the final two Yugoslav penalties. In a delicious twist of fate, Argentina and Maradona had a semi-final date with hosts Italy in Maradona’s Naples. The Italian press and fans went loco at Maradona’s incendiary comments. On the day of the game, there was unease within the stadium. Maradona was a deity in Naples – a man to be worshipped – yet here he was the devil incarnate trying to knock Italy out of their own World Cup. The indecision and failure of some of the crowd to fully commit to the Italian team transferred itself onto the pitch. In another poor game, Italy took the lead through leading scorer Toto Schillachi, only for Caniggia to once again rescue Argentina with a second half header. Argentina were going to penalties for the second successive game. The contrast from four years earlier was immeasurable. 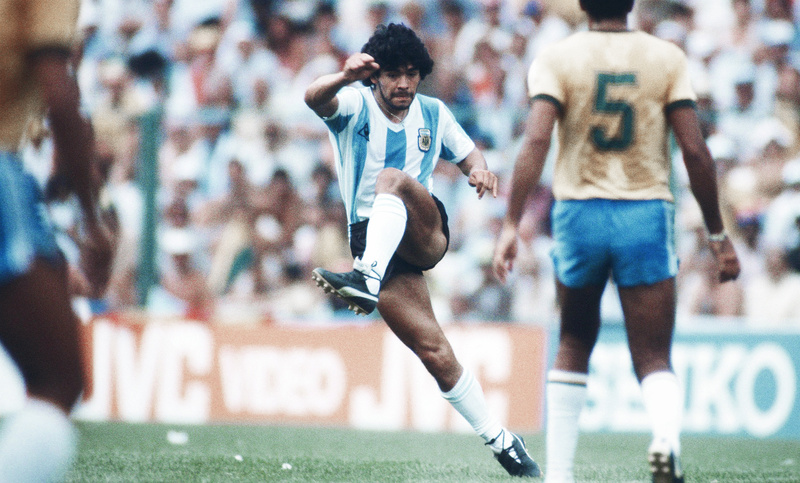 Maradona had been sublime, scoring all four goals in the quarter-final and semi-final in 1986. Now he was captain of a team that was bereft of ideas and inspiration, clinging to the prospect of a penalty shootout. At the final whistle the only incidents of note following the equaliser were the sending off of Giusti and the booking of Claudio Caniggia, meaning both would miss the final. The hosts would take on the reigning champions from 12 yards. Both teams scored their first three penalties, then the lucky charm that was Sergio Goycochea saved Roberto Donandoni’s effort. Next up was Diego Maradona. Looking around his factory floor at the San Paolo, a banner hung which read ‘Maradona, Naples loves you, but Italy is our country’. There, like an exclamation mark, hung the juxtaposition that permeated every aspect of this game. Maradona calmly dispatched his penalty with a gentle stroke of his left foot, rolling the ball into the opposite corner to the diving Walter Zenga. Aldo Serena was the next to go, knowing a miss would end the Italian dream. Goycochea by now feeling invincible saved the penalty. Maradona had led a very average team through to the final of a very average World Cup. A day later it would be the turn of Bobby Robson’s England. If there were a football God – other than the one who punches the ball in the goal – surely they would allow England to beat Germany and set up a rematch of the 1986 World Cup tie. I was convinced it would happen; the final would be a life affirming moment before reaching adulthood. I was wrong – the footballing God must have been busy that day. England lost on penalties to Germany, a habit we are still trying to break. It would be a repeat of the 1986 final in name only, however, as the spectacle was truly awful. 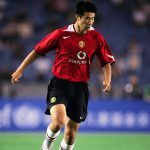 In one of the worst World Cup finals of all-time, a number of miserable records were set: the first World Cup final to have a player sent off, 21 minutes later the first World Cup to have two players sent off, the first World Cup final in which both teams didn’t score, and the most bookings in a World Cup final. West Germany won the game with an Andreas Brehmer penalty in the 85th minute, and even the decision was dubious. At the final whistle the West Germans were elated, and the Argentines were still protesting the sendings off. There, in the middle of all that melancholy, the greatest player in the world was in tears, struggling to comprehend that his body and talents had failed him and his nation. This was my third and final World Cup as a child, and it was not supposed to be like this. Where was the flamboyance of the ’82 Brazil team, where was the magic of Maradona’s left foot from ’86? At the end of Italia 90 it felt as if football and I were losing our innocence. Football was becoming a sport which prioritised results, money, stifling creativity and setting teams up to make sure they didn’t lose above all else. Maradona announced his international retirement soon after the World Cup final. I turned 18 five months later. It felt like a parting of the ways. World Cup tournaments would no longer be the same. And yet I should have known better. Maradona would be back to try and recapture past glories. 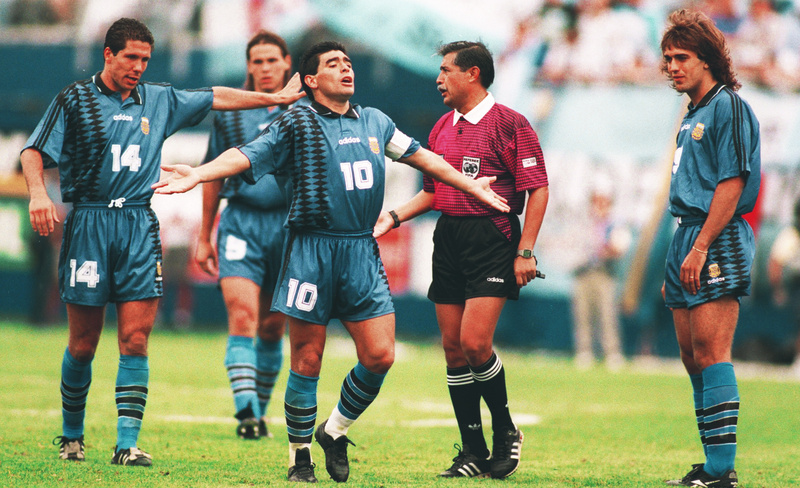 Maradona would return one more time, this time as the fallen angel.